One of the many challenges small business owners face is dealing with outreach and following up. Responding to incoming queries, answering emails that become “let me think about it and get back to you” replies, and the general follow up that comes with being a service based business is often too maddening to try to handle. A system is only as good as it’s user. Repeat after me: A system is only as good as it’s user. Okay. Now that we’ve gone over that important mantra, let’s talk about Streak. Like, perhaps, what the heck is Streak? 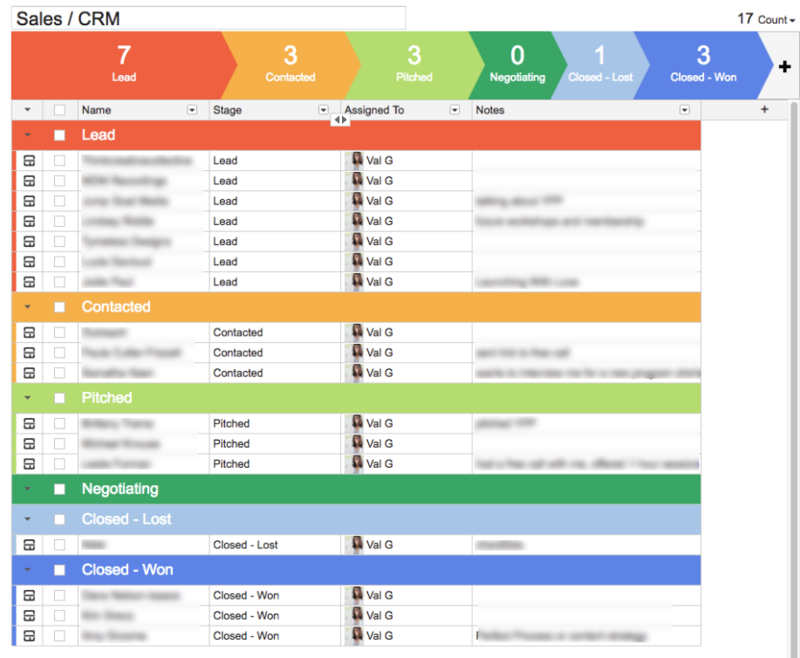 Put simply, Streak is a CRM (Customer Relationship Manager) inside your inbox. Put in even more human terms, Streak helps you keep up with all those communication bits you just can’t seem to manage on your own. Streak is a powerful tool that is completely FREE for up to 50 Shared Boxes and 200 Tracked Emails (more on what those mean later) per month! For a solopreneur or even a small team, that’s a lot of contact management for free! And the paid plans start at just $19/month so…. Yes, Streak is a real winner. Like many other business owners, I’ve installed and played with plenty of programs because I heard they’re great but then I get overwhelmed with the details so I do nothing (see above). If that sounds like a familiar story for you with Streak, this post is your guide to using Streak today and enjoying your inbox even more. Let’s unpack it! 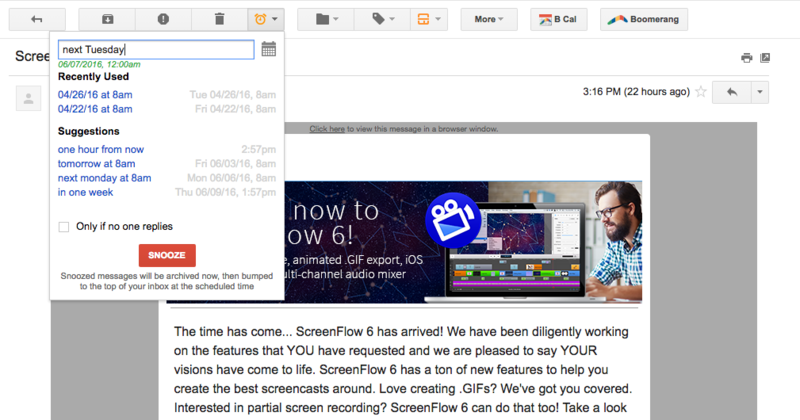 For instance, I got an email from Screenflow telling me about their new updates. I want to read the email in more detail but it’s not top priority right now. While I could push it over to my Asana to-do list, I’ve asked Streak to drop it back into my inbox next Tuesday when I know I’ll have more time to read and respond. You can write your snooze date/time in plain language like ‘next Tuesday’ or choose from a calendar. Instant sanity. Want to make sure your emails are read? Maybe you want to get out of the “email chat” that you seem to be stuck in? Send Later to the rescue! Simply compose your email and then click Send Later. 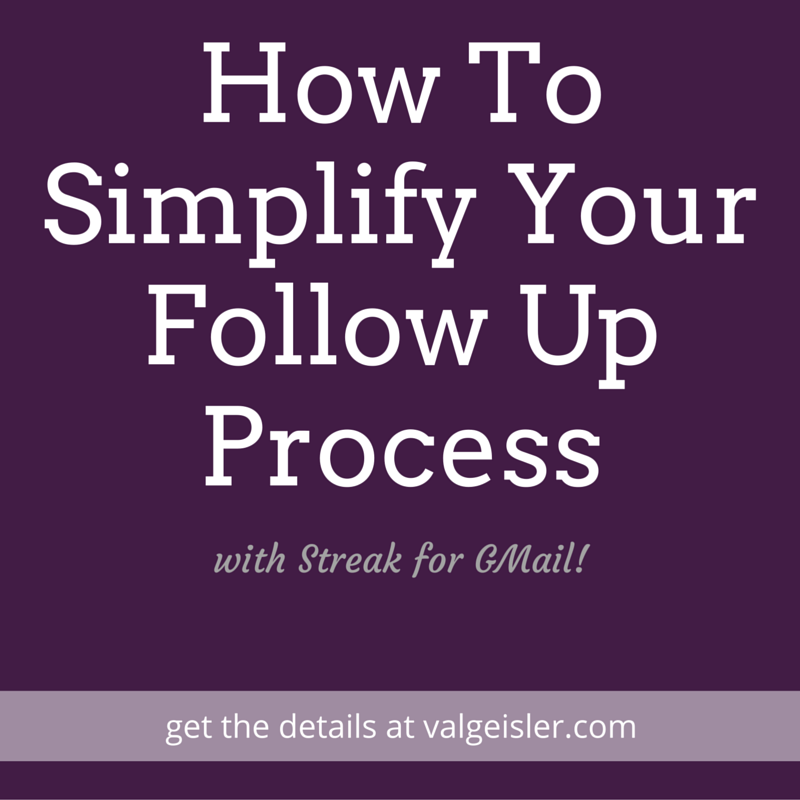 Specify when you want Streak to send your email and then click Send Later. Streak even knows how neurotic conscientious you are and gives you a confirmation and then tells you where you can see the email until it actually sends. Isn’t that nice?! Psssst – want to clean out your inbox at 10pm but not set the expectation that you’re there at that hour? Use Send Later to send those replies to your clients the next morning! Send Later is similar to Boomerang but I use this since it’s part of Streak. A box is simply another word for a folder. 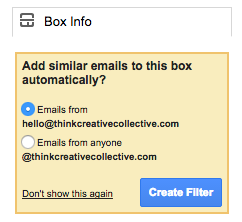 Adding emails to a box can look like many things in your own organization system but mine is all by client. You could organize by type (long term projects, short contracts, partnerships, etc.) or any other way you see fit. When you get an email you want to track, click the box icon at the top and add it to your box (or create a new box for it). Then you’re prompted to build a filter if you want one. This will add any future emails to that box automatically. Add a reminder task, attach files, or add a call log to the box. Some of these are premium upgrade features (read: you’ll have to pay to use them) but you can give them a test run in your free account first. Let’s be real. “Deal Flows” is a super corporate sounding term, right? If words like “Lead”, “Pitched”, and “Negotiating” aren’t words you use, you can change them right in the heading! Heck you can even change the colors if the standard primary colors are too much to handle. 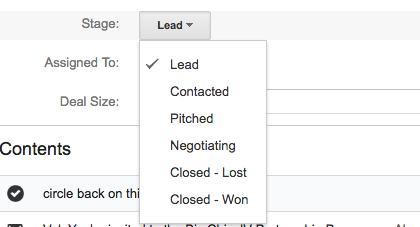 You can also see the entire overview when you click on “Sales / CRM” in your inbox under “Pipelines”. PS – that title “Sales / CRM” is the default but you can change that too! Customize all the things! With one glance, you can see if you’re heavy on the lead side of things and need to close a few more or any notes you made about recent contacts. I heart the overview mode and it’s where I spend most of my time. From the overview, simply click on the Streak icon next to the contact you want to interact with and you’ll have all of that communication inside their box. Box = Folder, remember. Think of Streak as your virtual filing cabinet! Much like streaking (being brave enough to get down to nothing and run around in public), Streak is really about getting into action. Set aside some time on your calendar to get Streak setup the way you’ll like it so that you will actually use it. Customize it to your heart’s content and relax knowing you’re finally on top of things the way you meant to be this whole time. Are you using Streak? Tell me in the comments below what you love the most or if you’re now inspired to download this powerful tool and put it to good use.